Samsung today said it plans to sell the Galaxy A6 phone in the U.S. beginning September 14. The A6 is a mid-range phone that fills the gap between Samsung's entry-level J series and flagship S series phones. The A6 features a 5.6-inch Super AMOLED Infinity Display with HD+ resolution. The phone is powered by a Samsung Exynos 7884 processor with 3 GB of RAM and 32 GB of storage. The A6 offers two 16-megapixel cameras, one on front and the other on back, each with its own LED flash. The rear camera has an aperture of f/1.7, while the front camera has an aperture of f/1.9. The camera app is able to use Samsung's Bixby Vision to identify items in the viewfinder as well as translate text. A 3,000mAh battery is sealed in the chassis, and the fingerprint reader is mounted on the rear panel. The phone includes good LTE support for T-Mobile thanks to Bands 66 and 71. Other radios include Bluetooth 5.0, GPS, NFC, and WiFi. The Galaxy S6 runs Android 8 Oreo and will be sold unlocked via Samsung.com for $360. Samsung says Sprint will also sell the phone on September 14, with other carriers to follow later. Carrier pricing may be different. 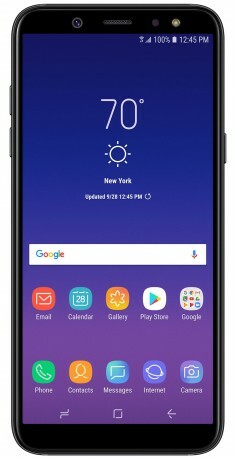 Last, Samsung is making the Galaxy J3 and Galaxy J7 available on September 14 unlocked via Samsung.com for $170 and $250, respectively. The Galaxy A6 from Samsung finds a good spot in the middle of Sprint's lineup. This affordable Android phone features a metal chassis, a pair of capable 16-megapixel cameras, and Samsung's Infinity Display. Samsung today announced the Galaxy A6 and A6+, mid-range phones that for the first time adopt its Infinity Display. The smaller A6 has a 5.6-inch screen with 1,480 by 720 pixels and the larger A6+ has a 6-inch screen with 2,220 by 1,080 pixels, giving them each an 18.5:9 aspect ratio. Samsung brings something other than the cheap J series or expensive S series to the US. I sincerely hope that Samsung also introduces the A8 and A8+ as well. Another great phone in the more affordable line up.